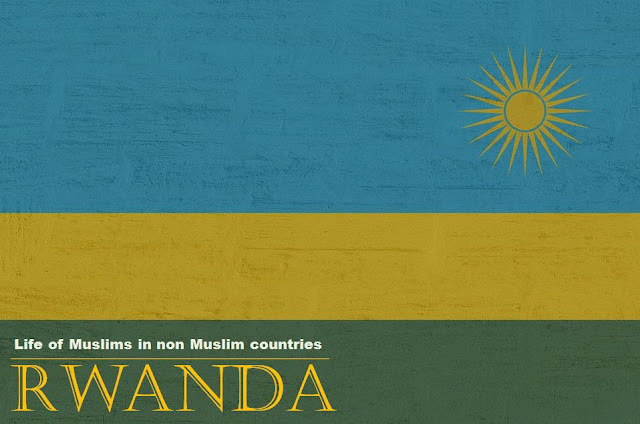 Islam and Life of Muslims in Non Muslim Countries: Rwanda ~ Islam My Ultimate Decision . Republic of Rwanda a country in Central and East Africa has Islam as the largest minority religion of the country. Approximately 4.6% of the total population of the country is Muslims, virtually all practicing Sunni Muslims. Estimates show that there are equal numbers of Muslims among the Hutus as there are among the Tutsis. Islam came to this part of the world in the 18th century, which was followed by the Roman Catholic Church, in the late 19th century, but due to rather inactive Muslim community, it soon became the state and the largest religion in the country. Islam came through Arab traders from Zanzibar who first entered the country in 1901. Alternatively, it has been argued that Islam arrived during the colonial period when Muslim clerks, administrative assistants, and merchants from the Swahili-speaking coast of Tanganyika were brought to the country. Islam was also bolstered by Muslim merchants from South Asia, mainly modern Pakistan and India. During its history, many efforts were made to impede the spread of Islam in Rwanda. These efforts generally exploited anti-Arab sentiment, and presented Muslims as foreigners. Catholic missionaries often went to great lengths to counter what they perceived influence of rival religions, such as Islam and Protestantism. Muslims were further marginalized by the fact that most Muslims settled in urban areas, whereas 90 percent of the population was rural. As neither Arab nor South Asian merchants ever attempted to further their faith, there was little spirit of preaching among Muslims. Rwandans built their first mosque in 1913. This mosque is known as Al-Fatah Mosque. April each year brings back the haunting memories of a heinous genocide of the Tutsi people which was carried out by the ruling Hutu government. In the 100-day period from 7 April to 15 July 1994, an estimated 500,000 to 1,000,000 Rwandans were killed, constituting an estimated 70% of the Tutsi population. Like other Rwandans, Muslims too were affected by the genocide and a large number of Muslims who took shelter in the churches were massacred without mercy, many say the the churches assisted the killers to kill all those taking shelters in the churches. Those who went to churches as a last resort to seek refuge but death eventually found them, even in what they hoped were houses of God. The indecent and inhuman behaviour of the church siding the Hutu killers, had a telling effect on the people of Rwanda and the number of Rwandan Muslims increased after the 1994 genocide due to large numbers of conversions. The conversions were also because of the fact that the Muslims sheltered refugees, both Hutu and Tutsi. A handful of Muslims took a stand during the hundred days of slaughter. Mosques that were once labeled by the Hutus as the "Devil House" came to save those affected by the genocide, irrespective of their faith. Jean Pierre Sagautu was one of these persecuted members of the Tutsi tribe, a convert to Islam from Catholic after his father and nine members of his family were slaughtered. During the mass killing of Tutsi, militias had the place surrounded, but Hutu Muslims did not cooperate with the Hutu killers. They said they felt far more connected through religion than through ethnicity, and Muslim Tutsi were spared. This good behaviour has had a telling effect on the Muslim population through conversion. Muslims ho once made up one percent of the population before the genocide, today “12 percent to 15 percent of the total population is Muslim”, according to Salim Habimana, a former Mufti of the country.